General Motors appreciates customers who choose to drive a Chevrolet, Buick or GMC Certified Pre-Owned. To show thanks, General Motors is offering My GM Rewards1 to reward purchases of a Chevrolet, Buick or GMC Certified Pre-Owned vehicle. There’s no cost to participate. Just enroll and you’ll start out with 1,000 points. Complete your profile and you’ll get 1,000 more points. 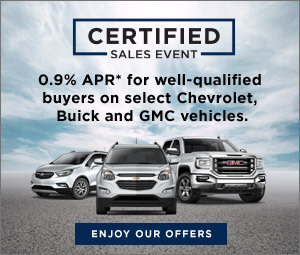 Buy a GM Certified Pre-Owned vehicle and earn another 5,000 points – they definitely add up fast! From there, you’ll earn doing things you already do with your vehicle. You get 6 points for every dollar spent on maintenance or repairs at a participating dealer. Want to earn more? Earn 10,000 points if you’re approved for the GM BuyPower Card®2 or GM Extended Family Card. Then, comes the fun part. You can redeem your points toward vehicle-friendly choices like Certified Service, accessories3 (roof rack, anyone? ), upgraded OnStar®4 packages and plenty of other nice rewards. Must be 18 years or older. Points may be earned and redeemed at participating GM entities, dealers or third party retailers in the United States (excluding Puerto Rico, the U.S. Virgin Islands or Guam). Points are not earned on taxes and certain fees and expire in 5 years from when points are earned. Some restrictions apply. Visit mygmrewards.com to view full program Terms & Conditions. Credit approval required. Terms and conditions apply. Must be a new account. Visit buypowercard.com for details. The My GM Rewards Loyalty Program is separate from GM Rewards Cards, including the GM BuyPower Card and GM Extended Family Card. Capital One, N. A. is the issuer of the GM BuyPower Card and the GM Extended Family Card. General Motors is responsible for the operation and administration of the Earnings Program. Mastercard is a registered trademark of Mastercard International Incorporated. Members may use My Rewards Vouchers on eligible Chevrolet, Buick, and GMC Accessories purchased at a participating dealership. My Rewards Voucher not applicable on Chevrolet, Buick and GMC Accessories purchased online. Voucher must be used by expiration date noted. Requires active OnStar service and acceptance of OnStar User Terms and Privacy Statement. Add-on packages such as Hands-Free Calling, Navigation and Stolen Vehicle Assistance are not eligible for earned points. Excludes taxes and fees. See onstar.com for details.